Buying a waterproof camera is a good idea for many reasons. While many current smartphones have some level of water resistance, if you want complete and utter confidence, a dedicated waterproof camera is a better option. With one of these cameras you can get up to all sorts of watery shenanigans. Whether you’re into snorkelling or diving, or want to document your first wild swim or SUP tour, the best waterproof cameras can be submerged for extended periods of time. Most of these waterproof snappers are also pretty rugged, making them tough enough to withstand a few knocks or scrapes while you’re out and about. These cameras are also more than capable of shooting during a downpour, so don’t be afraid to throw them in your backpack for those days when it's the mountains rather than the waves calling you. Five of the six best waterproof cameras we've chosen here are compact cameras. There’s also a dedicated action camera, the GoPro Hero 6, that may be better suited if you’re interested in capturing video (it captures stills too). When it comes to the best waterproof cameras and what to look for before buying, there are a number features to keep in mind. Firstly, exactly how waterproof is it? In other words, how deep can you snorkel, swim or dive with it? If you’re only likely to be splashing around in shallower waters, you won’t necessarily need a camera that can go deep. However, if you want to take photos of your underwater discoveries when diving, you’ll need something more heavy duty. The sensor and lens combination should be considered, in relation to what type and quality of images you want to capture, and whether the camera offers any zoom. Also, do you need extra features like built-in Wi-Fi or GPS? Kicking of our best waterproof cameras round-up, and landing squarely in the top spot, is the mighty Olympus Tough TG-5. It has a hugely impressive range of features for a variety of water-based and general outdoor situations. There’s a well-performing sensor, which is joined by a 25-100mm lens. While a 4x optical zoom is relatively limited, at the wide-angle end you’ve got an f/2.8 maximum aperture, which is great for letting in as much light as possible when shooting underwater. You can take the Olympus Tough TG-5 as deep as 15 metres, which should suit most needs pretty well. Its rugged credentials also make it virtually indestructible. Chuck in the Pro Capture Mode, for zooming in on specific details, plus 4K video, Wi-Fi and GPS, and you've got an incredibly well-rounded waterproof camera. In many ways, action cams are the obvious choice when it comes to searching for the best waterproof camera. And with that, the GoPro Hero6 Black is top of its class. It’s small and versatile, offering 4K video recording at up to 60fps - but stick to 30fps if you want to take advantage of image stabilisation. Unlike some other action cameras, the Hero6 Black is waterproof to 10 meters without the need for additional housing. If you want to film yourself surfing, for example, you can buy a dedicated surfboard mount and floaty. The latter adds extra buoyancy if the action cam happens to break free of the mount. Make use of the built-in Wi-Fi to use GoPro's QuikStories app to create a highlights reel of your adventures. Although primarily a portable video camera, you can also take stills with this action camera (it shoots in raw format). Touch Zoom gets you closer to the action. 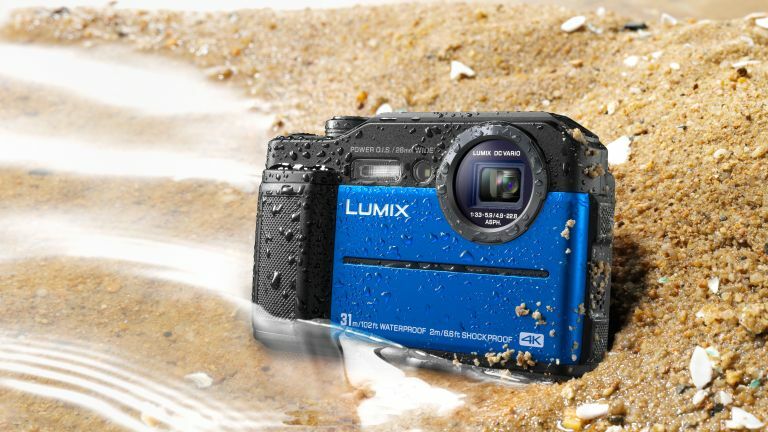 The newest model in our best waterproof cameras round-up, Panasonic’s Lumix FT7 is the perfect choice for recreational diving. Why? Class-leading 31-metre waterproofing, that's why. The Lumix FT7 also has a 20.4MP sensor, paired with a 4.6x zoom lens (giving you an equivalent of 28-128mm in 35mm terms). Pretty unusually for a tough-type camera, the FT7 has an inbuilt electronic viewfinder. You’re unlikely to want to use this for each shot, but it’s handy when bright light precludes you from using the screen. Other useful features include built-in Wi-Fi, 4K Video and Photo, and a body that’s not only waterproof but shockproof too. Coming in just behind the Panasonic Lumix FT7, the all-weather Nikon W300 offers 30-metre waterproofing. This makes it another ideal choice for divers, but don't let that stop you from using it in shallow waters or even on the trail during a downpour. Have fun Geotag-ing your images, with GPS/GLONASS/QZSS for checking your position or water depth on the W300’s monitor. Altitude and water depth stats captured at the time of shooting can be included in the photo’s data. Use the camera’s Tool button to display GPS, altitude/depth, air pressure/water pressure readings and more. Wi-Fi is also included for quick sharing of your shots. The buttons are a little on the small and fiddly side for a tough compact, making it less easy to use underwater than some of the other best waterproof cameras. If you’re more interested in keeping funds in your wallet than buying the best waterproof camera money can buy, the Fujifilm Finepix XP130 is a good budget option. It's also a good travel camera for family beach holidays. Regardless of the smaller price tag, it still can go as deep as 20 metres, which is useful for some types of diving and definitely snorkelling. The Finepix XP130 is an easy-to-use waterproof camera that may not outshine your smartphone in normal conditions, but for those water-based situations that your phone just couldn’t withstand, it’s a great camera to chuck in your backpack. If you’ve got a bit to spend on a camera but are keen to splurge more on other waterproof gear and outdoor gadgets, the Ricoh WG-50 is the middle ground option in our best waterproof cameras list. The WG-50 offers waterproofing down to 14 metres, so it’s fine for taking on your next SUP tour, wild swim or snorkelling excursion, as well as being able to withstand rain on a hike or ramble. There’s plenty of other rugged camera credentials too, such as freeze-proofing and shock-proofing. Another interesting feature is the set of macro lights around the camera’s lens, which are helpful for illuminating close-up underwater subjects. There are some compromises to be made, though, such as video recording being limited to Full HD, and a smaller screen than most other compact cameras of its kind. But when you consider the WG-50 is almost half the price of some of the other best waterproof cameras listed here, that’s not much of a sacrifice.